Long term neurological conditions carry a significant burden to the individual, their families and carers, the NHS, and to society as a whole. Neurological conditions such as Parkinson’s disease, motor neurone disease, and epilepsy result from damage to the brain, spinal column or peripheral nerves. Some neurological conditions are life threatening, with many severely affecting an individual’s quality of life. What is NHS England doing to support improvement in care and outcomes for people living with long term neurological conditions? 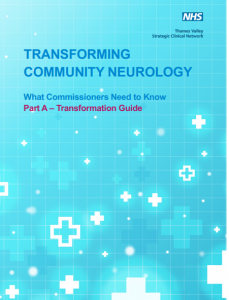 Improved community care for neurological conditions can improve care coordination for the individual across service boundaries, optimise self-management, and focus specific resources on those with the greatest need. The Transformation Guide, sets out the context and case for change then introduces the key features of new models of care. The Reference Reports document presents the original individual findings on the core topics, which informed the writing of the Transformation Guide. To illustrate what is already being achieved around the UK by using new models of care, a set of Case Studies is also provided. If your organisation is involved in neurology projects, or you would like to know more about the work of the national team, please contact england.clinicalpolicy@nhs.net.